Calgary-born Chef Geoff Rogers first entered the restaurant industry as an expediter and quickly crossed into the kitchen, where his work ethic helped him rise rapidly through the ranks. This hands-on, trial-by-fire education was invaluable experience that would carry him to notable Calgary establishments, including the Red Door Bistro, River Café, and Home Tasting Room. 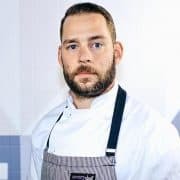 Geoff’s notable resume led him to the West Coast, taking on roles as Executive Chef at Market Restaurant, Chef de Cuisine at Fable, and Executive Chef at Blacktail. Now leading the kitchen at Savoury Chef Foods, a Vancouver premier catering company, he strives to uphold the highest standards of quality and flavour, and specializes in engineering unforgettable menus that feature the very best fresh, local, and seasonal ingredients.